That My Little Pony Windows Phone 7 Portal (my, what a long name for an app!) that we posted a while back just received an update not long ago, and it added some rather useful features that I'm sure all you Windows Phone 7 users will love. - "Yay Button" and instant "Eeyup"
Pretty neat, eh? In case you own one of these fancy phones and haven't downloaded this app yet, now might be a good time. Edit: And it's over. Hope you enjoyed the stream! In a little under half an hour the Pony Game Developer's panel will be airing, featuring various developers of fangames talking about their projects and exhibiting them. I'm really excited for this particular panel and what it promises to reveal to us, and after it's done we will post a summary of new and interesting things from it for all you that can't watch for some reason. If you can we would highly advise to put away whatever you're doing, sit down and watch the stream. Since MLP:Online recently announced that they were releasing soon after BroNYCon they decided to give their website a well-deserved upgrade. In case you want to check it out it's located at www.mlponline.net, although by the looks of it the site is still undergoing some tweaking and the addition of minor stuff. Anyhow, don't forget that the team is appearing at BroNYCon in about 30 minutes, so we should have far more details on the game after that. See you on the stream! A little while back Filly Gamez (the developers of that visual novel Welcome to Ponyville) announced that a couple of their team members are attending BroNYCon. Specifically Raish Dash and Writers Block are going, and they will be on the game developer's panel in the tail hall at 2:00pm. Apparently they're answering questions about the game (most of which will probably be on the romance feature) and will present a playable demo for everypony to check (which most of you will presumably use to test romance). They also said they will be handing out free vinyls to fans of the game, although I'm guessing that they will have a limited supply so try and get a hold of one as quick as possible. Oh yeah, they also had an interview with The Lighting Round podcast. Find it after the break! 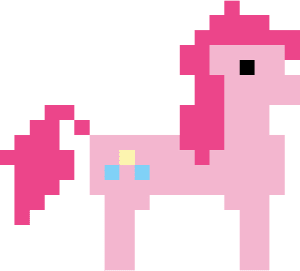 OFFICIAL 8-bit Pony Game Coming Soon! Visitors to the Broken Yolk will also receive a secret code to gain exclusive access on Hubworld.com to the eagerly anticipated "My Little Pony Friendship is Magic" themed, 8-bit "Adventure Pony" game already teased on the network. Hopefully they'll release it to the general public after a set period of time, but in case you happen to be attending the San Diego Comic Con be sure to pick up a code so you can play. If you happen to be feeling really generous I'm sure everypony would appreciate some screenshots, right? Sometimes there are games that are good, but since they have such terrible graphics people simply ignore them. Usually this is because most programmers are mathematically oriented and not artistically oriented, and is the reason why most game developers hire an artist to help them deliver as much polish as possible. Please, Make Me SMILE! is one such game. Made for a 24 hour game creation competition, PMMS is a point 'n click adventure game that seems to have had its sprites created in MS paint so the author could focus on somewhat more important things (programming), and while the game itself isn't half bad most people will probably ignore it due to the rather poor sprites. Anyhow, I'm pretty sure that the creator would appreciate it if you leave any feedback in the comments. Hopefully for his next project he'll be able to obtain somepony to help him with the in-game art and create an even better game for the masses. Cheerio! Looks like somepony is working on yet another platformer (can't have enough of those! 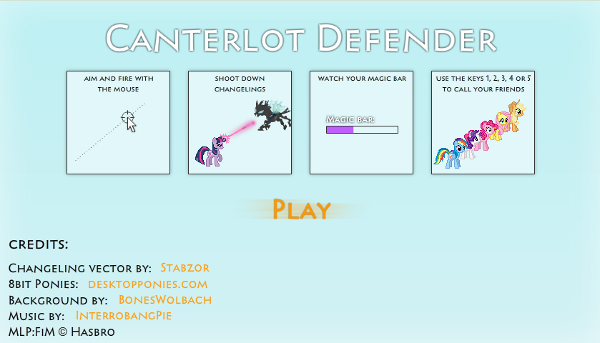 ), and despite it being a My Little Pony fangame you play not as a pony, but as Angel Bunny. Say what you will but Angel Bunny is the pet that gets the most screentime but still lacks a fangame, so it's about time he got his own adventure. The gameplay mechanics shown in the video look rather...interesting, with something called "bunny power" that seems to fuel Angel's various abilities. The video also implies that the story has something to do with Gummy; as soon after the toothless aligator appears the developer jumps into a pit in a somewhat humorous attempt to avoid spoilers. Mane 6, the team behind My Little Pony: Fighting is Magic will participate in our very own Pon-E3! 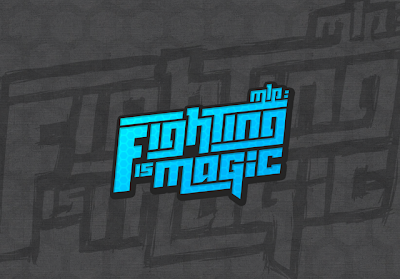 On Saturday, July 14th (exact time unspecified at the moment) they will host a stream of their "EVO build": a 4-character demo of Fighting is Magic that was intended to be seen at the Indie Showcase of EVO 2012. 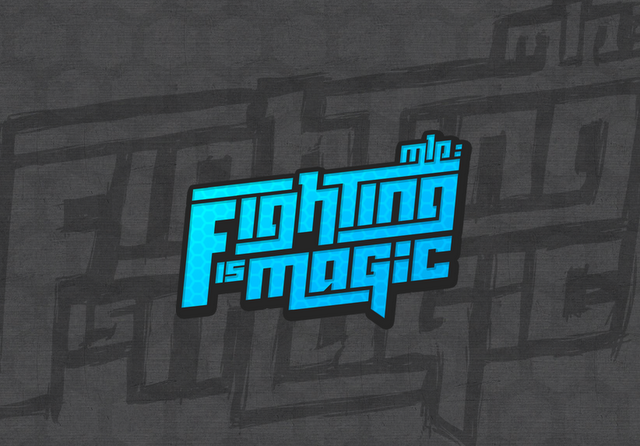 For those of thus (myself included) who cannot attend EVO 2012 just to see a build of Fighting is Magic this should be quite interesting, as the team's last stream was a couple months ago and a lot has changed since then. A couple months back we posted about a very promising Daring Do Sidescroller Demo, and never heard anything else about it afterwards. Unbeknownst (and unreported) to us was that the project was updating behind almost everypony's backs, and until today we had no idea it had even made any progress. But my, what progress has been made! The game has evolved from a simple (and very pretty I might add) framerate test into a full-fledged fangame with loads of levels, a couple bosses, beautiful graphics and a great soundtrack. While we can't provide a review yet due to the state it's in and the game's large size for a Flash game makes putting it on the Arcade a tough decision, we can say that this game is a must-play, and is undoubtedly the greatest My Little Pony platformer we've seen to date. Most of the web games that we receive on Equestria Gaming are Adobe Flash, and although we do get the occasional Unity game I have noticed that HTML5 games are relatively rare. This is probably because of the somewhat steeper learning curve, the lack of full-featured engines (libraries, on the other hand, are in no short suppy), and the fact that usually you need your own web host to make it publicly available. 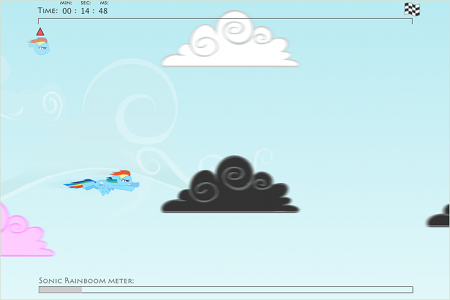 So far this is only the second HTML5 game we have came across on our website, with the first being Pony Wings, and only the former was in a complete state. 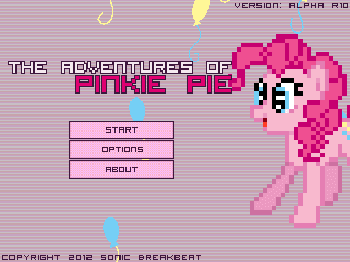 For indeed, The Adventures of Pinkie Pie is still in alpha and only contains a couple unfinished stages, but it seems rather promising and every game deserves a chance, right? In case you're interested in following the game's development they have a website over at http://pinkamena.tripod.com/, and our arcade recently added the game if you want to check it out every once in a while and see if there's any new content. Earlier today, Equestria Gaming reached a major milestone - 2,000,000 pageviews! In an event of huge coincidence, we hit 2 million within 24 hours of Equestria Daily hitting 200 million, and FimFiction hitting 100 million. If that isn't spooky, I don't know what is! Anyway, we'd like to extend our sincere thanks to all those who follow EqG. This site wouldn't be where it is today without you guys. Here's to 3 million and beyond! Brohoof.com is hosting yet another Minecraft event, and you know what that means! Tons of partying, tournaments, quests, etc, and if their past events have been any indicator there might be a hostile invasion or two. It started at 12:00 PM and should last for about 3 hours, although chances are the event might go far over the petty limit if enough people attend and stick around for long enough, as the limit is somewhat flexible. There's also a post over at their forums with far more detailed info as to what you can expect, which can be found here. Why not go on and be a part of the fun, eh? If I recall correctly the server IP is mc.brohoof.com (and if that doesn't work there is always 38.108.185.195 as a backup), so if you own Minecraft then you really have no excuse for not attending. A while ago this bloke named ReignOfComputer offered to include Equestria Gaming on an app for Windows Phone 7. He claimed that the app would act as a central pony hub for all WP7 users, making life easier for the lot of 'em and giving him some recognition among the fanbase in the process. Well now that the app is available for public use, does it live up to his claims? We have no idea, as we have no way to test it at the moment, but if you have a Windows Phone 7 then you can give it a spin. Just follow the link above and follow any instructions that you might get, mkay? Oh, right. There's also a press release after the break, and if you like that kind of stuff...well, it's there in case you want it. It gives a more detailed summary as to what the app actually is, and what you'll find within it. 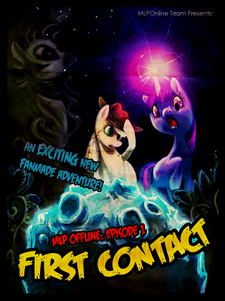 The creators of MLP: Online, a very anticipated project that's been in the works for over a year, are working in overdrive to get MLP: Online Single Player Episode 1 ready by it's release at this summer's BronyCon, on June 30th, a little over 9 days from now. You can find a countdown clock on their website. 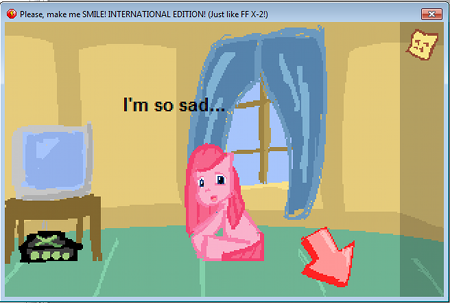 As many of us know, there is a plethora of amazing MLP fangames currently in development. Many of them are highly anticipated, and others are relatively unknown. Pon-E3 (sort of like E3, but with ponies) is an opportunity for the devteams behind these games to present their work in progress through whatever media they choose, all in a comprehensive, two day event right here on Equestria Gaming. These two days are Friday, July 13 and Saturday, July 14. There will be a total of 10 timeslots across these 2 days where individual development teams will post about their games through screenshots, gameplay videos, trailers, or perhaps even playable demos. The devteams which will present are secret at the moment, but the full list will be released closer to the event. One thousand years ago, when Luna was freshly banished, we reviewed the Pony Platform Game Engine Test. Believe it or not, the Pony Platform Game is a platformer where you play as a pony. Like so many awkward situations before it, the game begins when Spike enlists the services of another (namely, you) to help him defeat a bad case of the munchies. Does the Pony Platform Game stand out from numerous other... pony platform games? Is 8-bit the art medium of the new millenium? Can one manage to get their OC's head stuck in a floating earth island? All this and more, after the break. 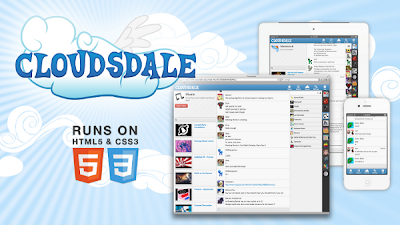 Our partners over at Cloudsdale, an up-and coming brony social network, recently released a major revision to their site, which has now left beta and is open for everybody to use. From what I've experienced of it, Cloudsdale is a very unique network, quite different from sites like Facebook or Twitter. It's user base is growing steadily, and it's definitely worth checking out. Have some copypasta after the break. One bright, optimistic morning, you awake to find that someone’s stored a potion in your computer. Hazily, you withdraw the useful item, recalling last night’s dream: A professor, although slightly confused by the complexities of gender, had welcomed you to a new world. On this morning, after ten long years of isolation, you’re finally ready to conquer the dangerous grass outside your front stoop and see the world. And, just when you think today couldn’t get any better: you crack open your first red-and-white ball and a wide-eyed filly stares back at you. If at this point, you’re not yet overcome by nostalgia and anticipation, you’ll want to go read another review, or grow a childhood and come back later. All on the same page? Good. Well, is Ponymon Dawn/Dusk worth your time, or is raising and battling your own team of Equestrians just another pipe dream? Perhaps you should find out after the break. Y'all remember Filly Games, right? Well if you don't, they're the developers of "Welcome to Ponyville" which you have probably heard of. If you haven't, well then you don't appear to have been paying much attention to either us or Equestria Daily that much within the past couple months. Anyhow, this guy who goes by the username of mrrandomlulz recently interviewed those blokes and posted his interview over at the Devil May Cry forums. It doesn't tell us much that we didn't already know before, but in case you're interested in reading it you can find it at http://devilmaycry.org/community/threads/mrrandomlulz-gets-an-interview-with-fillygamez.11217/. As most of you probably know I have great disdain for the cloud-dodger genre. In general you play as Rainbow Dash and dodge clouds for eternity, or at least until you hit one. Sounds boring, eh? 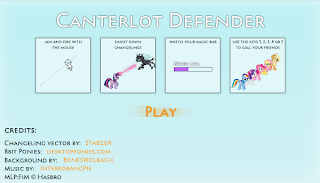 In most cases you'd be correct, but a game by the creator of Canterlot Defender has been uncovered, and despite it's rather overused genre it seemed rather promising. Does Dash manage to transcend its comrades and become a great sidescroller, or is it just as mediocre as the others? Find out in our review after the break! 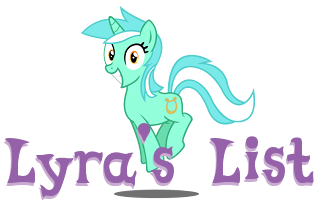 If you're unfamiliar with Lyra's List, you can check out what it is here. You can find the submissions for Lyra's List #2 after the break. There are some really good ones here, so I'd recommend taking a look. The deadline for submitting to Lyra's List #3 is June 30, 2012 and submissions are now open.